Acupuncture is a complete medical system that can be used to treat various conditions ranging from pain, anxiety, depression, infertility, insomnia to the flu. Facial Rejuvenation is all about beauty from the inside out. Facial acupuncture can help you look younger, more vibrant, and promote better health too. Herbal medicine is the use of natural substances formulated together to provide therapeutic effects in treating various conditions. Tui Na sometimes also referred to as “medical massage therapy” can help promote blood and fluid circulation and relax tight muscles. Cupping is done by applying gentle suction to a certain area to promote healing and blood circulation. It is great for relaxing tight muscles. Guasha is a technique where a tool is applied on the body to increase blood circulation. It can feel like a deep tissue massage. Moxibustion also known as “moxa” is the practice of burning an herb called mugwort over acupuncture points for therapeutic purposes. 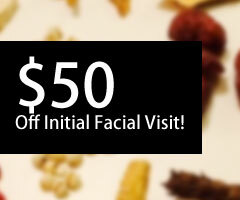 $50 off Initial Facial Visit of $275!